I am no longer going to have delusions on how often these updates will be sent! I’ll probably get them out after I go to the ALS clinic, which means about every four months. We’ve definitely had a lot going on in the last few months. I hope you’ll make it through this e-mail! My cough assist machine was delivered mid-June, and I was very good about using it until I got sick a few weeks ago. Then once I was feeling better, I wanted to hold off until after the ALS clinic so I would get a true measurement on how my breathing is doing. I understand that may only seem logical to me! I’m trying to get back in the habit now. I decided to quit acupuncture in July, but I’m now getting a massage twice a week and am still going to the chiropractor. I tried to stick with it (pun intended :-), but as my muscles continued to atrophy, the procedure became pretty painful. Since I could never tell if it was actually helping and the stress of anticipating pain wore me out, I gave myself permission to quit. My week is a bit happier now! I also decided to swap out the Chinese herbs with more traditional supplements; my acupuncture guy couldn’t seem to keep track of which herbs he was giving me. It didn’t inspire much confidence. In early July, I also agreed to be a part of a video the ALS association was putting together for a fundraiser being held on Oct. 12. I’d give the details, but they’re already sold out! I wasn’t sure how much of the interview they would be able to use, since I’m pretty incomprehensible when I cry, but the editors did a good job. We got a copy in the mail a few days ago; I’ve never liked myself on film, but Luke looks adorable in it! I’m still trying to figure out how I feel about having subtitles added while I’m speaking. The most exciting part of July, though, was finally completing work on the elevator!! It’s been so nice to have the house back and not have to worry about what Luke might find on the ground. I’ve been trying to limit my use of it, though, and only ride when I’m feeling really unstable. Unfortunately, I am feeling unsafe on the stairs more often than not. Luke loves it, though, and seems to think it’s a cool toy we got just for him. Getting him on is usually pretty easy; coaxing him off is another matter entirely! The elevator has also been helpful with Chamblee. Our poor little arthritic dog has a lot of trouble with the stairs. As some of you may have heard, we were pretty worried about Jin these past months. He started seeing some severe atrophy in his forearms and shoulders and began to drop things more often. Since these symptoms matched some of my early warning signs, we were understandably concerned. It also made us rethink my situation since the likelihood of a young married couple both having ALS is astronomically small. We decided to follow up with a contact my friend provided and were able to get an appointment at John Hopkins in mid-August for both Jin and I. Thankfully, the doctor said Jin does not have a neurological issue. It’s a good thing. I feel like I’m handling things ok, but having Jin diagnosed with something serious may have broken me. She couldn’t explain the atrophy and clumsiness, but basically told him to stop obsessing and start working out. As for me, she agreed with Emory on my diagnosis. My progression seems to be a textbook case, so I wasn’t surprised and didn’t get too upset. I only started to cry after she had me try out a walker. That quickly turned to irritation, though, when she mentioned anti-depressants. What is it with doctors? Four out of five who have seen me crying offer me drugs. I understand they want to help, but I consider crying a healthy outlet. They should be more worried about my mental state if our conversations didn’t make me cry! We only had appointments on Thursday, so we had the rest of the weekend to catch up with friends who live in the area. Those visits definitely made the trip worth it! I missed Luke more than I can say, but I knew he was in good hands. Ellen, dad, and Jin’s mom worked in shifts and kept Luke very happy. When we got home on Sunday, it didn’t seem like we were missed at all. I’m still taking Rilutek and the experimental drug Arimoclomol and continue to tolerate them well; although their effectiveness is up for debate. Dr. Glass prescribed a muscle relaxant in May, but I only took that for a month. It made me tired and didn’t seem to lessen the twitching or help with the muscle cramping. They suggested a few other meds and some vitamins I can take to try and alleviate some of these symptoms, but I haven’t started them yet. I’m a big believer in trying one new thing at a time and I haven’t decided what to try first. I’ll decide soon, though, since the cramping is getting a bit out of control. My legs give me the most trouble and usually cramp in the morning when I wake up; my hands, arms, and abs cramp during the day if I hold a position too long. The muscle spasms are also becoming more frequent and are sometimes strong enough to cause my hand or entire arm to move. I’m also starting to feel them along my back and quite a bit more in my facial muscles. That worries me since I feel like I’ve already lost a lot of facial expression and it seems like the spasms precede loss of function. That could just be my paranoia, though. • Walking down stairs more difficult; requires more concentration since knees/legs feel more unstable. • Increase in saliva causes me to drool more often. • Must talk very deliberately to be understood. • Harder to move food around in mouth. • More difficult to sit up from lying down. • Writing has become very labor intensive. • Feel dizzy when I sit up. • Legs and arms tighten and flex when stretching or when I first stand. • Become out of breath at times when speaking. • Facial muscles fatigue more quickly during conversation. • Shoulders and hands are incredibly weak. • Holding toothbrush up more difficult due to weak shoulders. • Must steady right hand with the left when applying makeup. • More difficult to take a deep breath. • Eating requires considerable more energy. • Avoid foods that are hard to handle (soups, salad, deli sandwiches). We went to the ALS clinic on September 21 and they confirmed that my breathing is not doing well. I wasn’t too surprised since I’ve noticed a change, but I was surprised at how low I scored. I’ve gone from 102 to 97 then 82 and now 66! They then had me retest lying down, I took and scored 33. I’m still not crazy about the idea of being hooked up to something at night, but I’ll do just about anything to be around for Luke. If that means having a mask over my face at night and coming to terms with the damn feeding tube they talked about, I’ll fall in line. Dr. Glass doesn’t think I need the feeding tube yet, but he’d like me to get used to the idea before I actually need it. I’m obviously less than thrilled at the prospect. For now, though, I have decided to do something about my walk and get fitted for a leg brace as recommended by the physical therapist. She said it should help me walk without looking as though I’m hyper-extending my left knee. I actually had an appointment last Wednesday to have a mould made of my leg so they could create the brace and picked it up yesterday. It does improve my walk, but it takes more energy to stand and walking downhill is a bit tricky. I’m sure it will get easier, though, as I get accustomed to it. As for my hands, I was given hand splints by the occupational therapist to wear at night to keep them from contracting; I’ve been waking up with my hands balled into fists. I think I’m tolerating them ok, but I have woken Jin a few times in the early morning impatient for them to be taken off. And while Jin has already been adjusting covers quite a bit, he’s now officially on cover duty. Hopefully, I won’t drive him too crazy in the wintertime. While we were at Emory, Jin also talked with Nicole and Glass about the various fundraising events to get an idea about the different groups. Jin’s been a little frustrated by the lack of organization. During the conversation, we found out the clinic and ongoing research is self-funded. I think Jin is going to create a foundation and put his rolodex to good use. It will be good for him to have a focus and goal; I know it’s hard on him to feel so helpless. I have such a wonderful husband. Luke is still wonderful as well even though he has fully embraced being a toddler. He can throw a fit with the best of them and loves to repeatedly shake his head no. I think his cousin showed him that last trick. My sister-in-law, Javiera, and my niece and new nephew were here for the first two weeks of September. I had a great time getting to know the kids, and Luke seemed to enjoy having a playmate once they worked through their differences! Luke has also been attending GT football games and does a great job clapping for our team. He’s been running and stomping around the house and bounces to the beat when he hears music. He’ll even dance to Daddy’s cell phone. It’s been amazing to see him beginning to understand so much more of what we say. Although that can cause a bit more irritation as well when we know he understands and chooses to pretend otherwise! His first “word” was oh-oh back in July and he’s since added dada, no, and (finally!) momma. He also pants when he sees the pups, so we consider that his word for dog. Luke has done really well with signing; he’s learned “all done”, “more”, “milk”, “drink”, and “shoes”. We’re working on “please”, “socks”, “hat”, “on”, “off”, and “outside”. I think he’ll catch on quick. A friend from soccer has organized a team to join the ALS walk being held November 3rd at Centennial Olympic Park. Registration begins at 8:00. Jin, Luke, and I are planning to walk, and we’d love for you to join us or donate to the event. You’ll find the details at http://walktodefeatals.kintera.org/faf/r.asp?t=4&i=226925&u=226925-187788351&e=1221144405. From there, go to “My Team Page” then “Join Our Team” to join the walk. We hope to see you there! Also, I’d like to tell you about a video you can view on-line. It’s really well done, and each time the video is viewed, a donation is made to help find a cure for ALS. Please pass it on! Your prayers and encouragement mean so much to us. The support you’ve given has been amazing! Kim Kim Fight! is dedicated to aid the Kim family as they battle the financial and emotional turmoil caused by living with ALS. 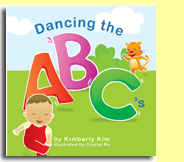 "Dancing the ABC's" - Order now and help promote awareness while contributing to the Kimberly Kim Foundation. Copyright © 2019 Kim Kim Fight!